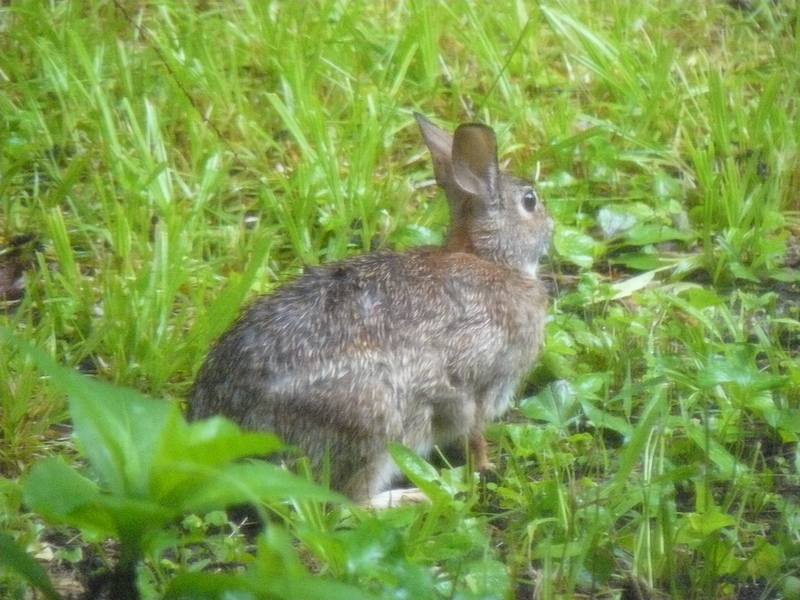 There hasn’t been a single time I have looked out the window or stepped outside in the past few weeks that I haven’t seen a rabbit in my yard. Not just at dusk or dawn, no, I see them at all times of day. 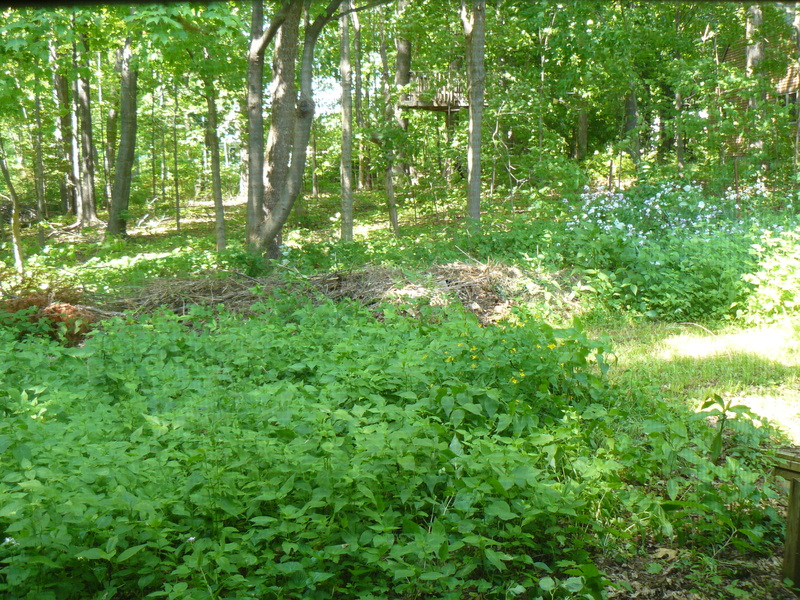 It finally dawns on me this morning that there must be a family living in the hidden growth of the copiously overgrown fringes of my yard. And even though I often see two together, I’ve come to think it is the same guy out there exploring all the recesses of my lawn. Judging from the intent of constant chewing I observe, there is most definitely something delicious to eat there. I can only imagine the feast he would have if I actually planted all the vegetables I dream of planting in my perfectly sunny garden. I keep thinking about the tale of Peter Rabbit. I know I can’t plant what I want without building fences that could keep him out, and I hate the idea of fences, so I plant a few things in pots raised off the ground next to my kitchen window instead. I’m now sitting in my office feeling the cool breeze coming through the window I can finally open after removing the storms. 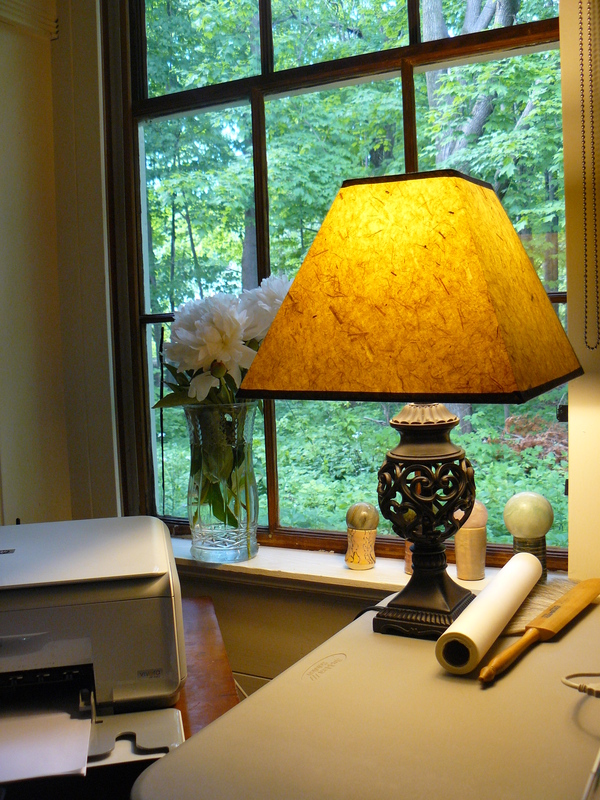 I love working in this little room that faces north, being able to experience the sun in my neighbor’s trees beyond in the freshness of the day, appreciating the seamless view that is possible without fences there too. 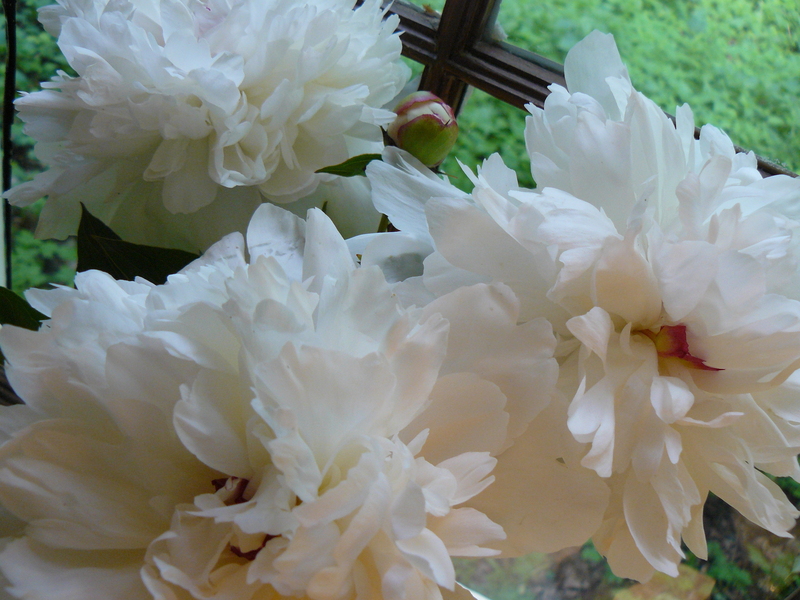 I love the fragrant perfume of the peonies from my garden, now in a vase sitting on the sill of the freshly polished window and juxtaposed against the green of the forest beyond; how lush these white fluffy blossoms are; how grateful I am that they are part of the legacy of this house and property I am caretaker of…. 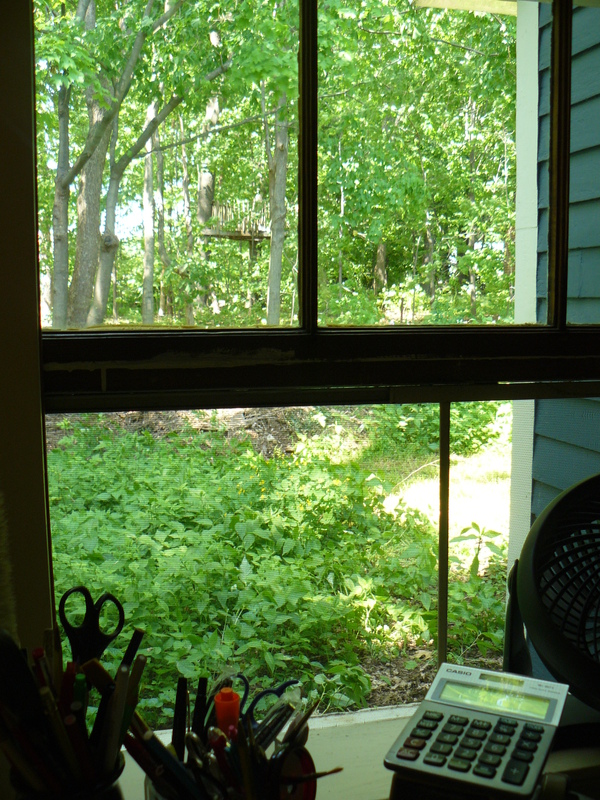 Looking out the window, I can see only one small portion of mowed ground where I have made a path to the pile of yard clippings and debris that get deposited out of sight. And wow, there he is again, my rabbit. In perfect view, munching away in the clipped grass, staying just long enough for me to snap a photo before he hops off back into the brush. That this rabbit (or rabbits) can be so prevalent in my life at this time gives me pause again. My Animal Spirit Guide book tells me that if rabbit shows up “this is a very creative time for you, so it’s important to quickly take advantage of any opportunity that comes your way unexpectedly.” Hmmmm. Smile. My very own Peter Rabbit, except he is free and finding his way into my creative imagination instead of Mr. McGregor’s garden…. Wonderful photos of your window view, love the peonies and the message from Peter Rabbit. 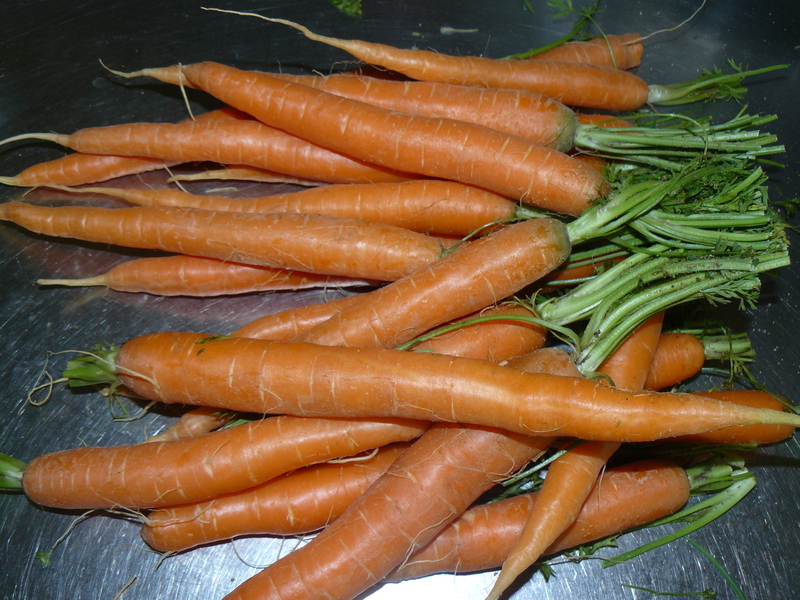 Now what are you going to do with all those carrots? !